I know it's still early to start the mooncake but my girl will be leaving for her next semester study soon. So, I want to let her enjoy the homemade mooncakes as many as possible. This is another fantastic batch of Fuzhou mooncake I love. 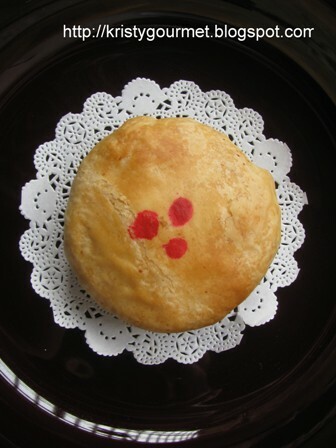 Its actually quite similar to teochew mooncake. 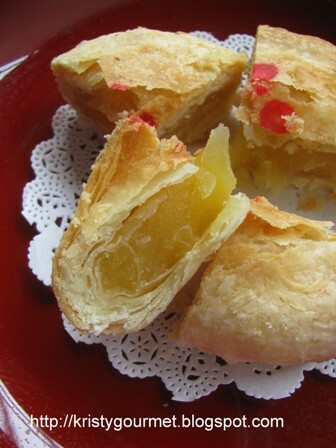 They both using the flaky Chinese pastry for the wrapping. 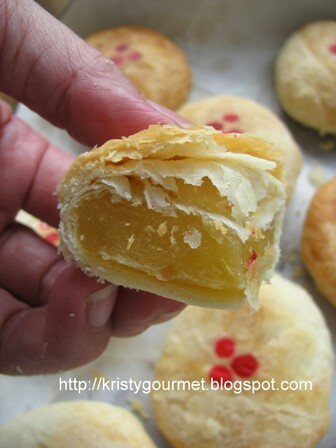 I really enjoy the flaky crust especially homemade ones, its much more thinner compare to the store bought ones. Homemade is always the best, isn't it ? (2) in another bowl, combine ingredients (B) till everything well cooperated then divide into 10 portions. 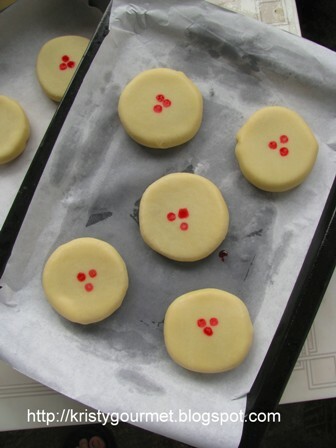 (6) fill in dou yong and sealed it, place the sealing part by facing down then slightly flatten it with the rolling pin. (7) transfer filled dough to baking tray line with parchment paper then bake at preheated oven 185'-190'C for about 20 minutes or till nicely brown. I am actually expecting larger pastry. I should have make 6 portions out of it instead of 10. However, the result still very pleasing. The crust is absolutely inviting which is flaky & delicious. 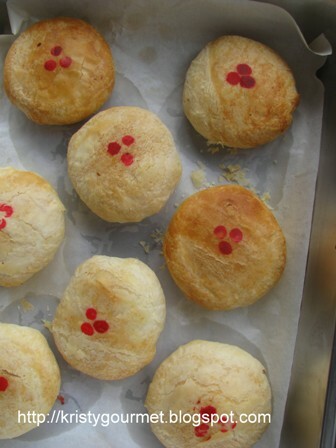 Its been a long long time eversince the last batch of Chinese pastry I made. wow how flaky and gorgeous! And I love that bean filling too. Hi Kristy. How long can the dou yong filling be kept? Can the dou yong be kept a long time like a the lotus paste? Hi Kristy! How are you doing? These look flaky and soo delicious!! First of all, thanks for stopping by my humble little space. Now, to your question, it can at least last for 2-3 days without refrigerated after baking with the pastry crust. It won't be a problem if you're keeping it refrigerated the whole time. It can actually last quite some time. For store bought dou yong can actually last for a very long time even without refrigerated. As for homemade dou yong no preservative was added in. sorry for being ignorant on baking stuff. could you kindly let me know on "wrap ingredient (B) into (A)" meaning that the bottom layer should be dough(B) and the the top layer should be dough (A)and the wrap dough (B) around dough (A). Its OK ! 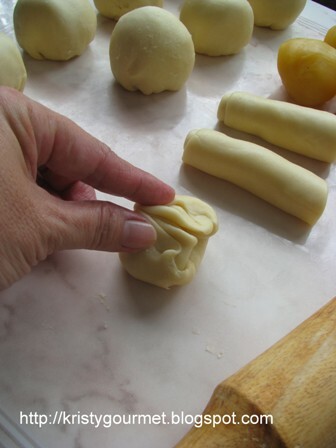 The outer layer should be dough (A)and what you wrap inside always the mixture of shortening & flour (the only 2 ingredients), just like making pastry crust or croissants. You need butter, pastry margarine or shortening to give you layering effect. Hope this will help. Enjoy & have fun. Thank you so much for your prompt response. Much appreciated.